Talang Mamak tribe belonging to the Proto Malay (Melayu Tua) who is a native tribe Indragiri Hulu with the title "Interest Tuha" which means the first tribe to come and have more right over natural resources in Indragiri Hulu. There are two versions of the existence of this tribe Talang Mamak. According to Assistant Resident Obdeyn-Indragiri, Talang Mamak tribe comes from a recessive Pagaruyung customary and religious conflict. Meanwhile, according to myth, these tribes are the descendants of Adam to the three that come down from heaven to Earth, precisely on the River Lemons and settled in the River Tunu (Durian Smallpox). This is evident from the phrase "Land of Makkah Kandal, floating in the River Limes, menjeram in Sunagi Tunu" That's the first man in Indragiri named duke. Gansal Village Sub Trunk Overseas Langsat Gansal Indragiri Hulu Territory National Park Bukit Tigapuluh accessible path Army. Namely through Siberida (Pekanbaru-Siberida 285 km) by using the car for the road to former concessionaires. Or also via the Simpang Pendowo about 2.5 km from the village Keritang, village located in the District Kemuning Indragiri Hilir directly adjacent to Indragiri Hulu regency, Riau. The route as far as 22 km fro m Simpang Pendowo until well into the border area of ​​Bukit Tigapuluh National Park (TNBT) or also better known these Dalex Road, should be done on a motorcycle "man" or a car bergardan two. Furthermore, the distance from the road to the hamlet Tuo Dalex Datai about 6 to 8 km only passable on foot. Although not so far, but do not expect will soon be up. Because, forded field must "climb the mountain the river flows through a beautiful valley." So, jreng stamina required to take 1 to 3 hours drive. Usually on a particular day, Talang Mamak tribe will go down to the nearest village, or Siberida Keritang. The goal is to sell the farm or forest products which they obtained to buy the necessities of life. "But, now we've rarely come down. Forest products is reduced. What we rely on for daily life is the garden, "explains Mr. Toad or pack Sidam who also served as Chairman of the RT Hamlet Tuo Datai. Currently, the total population of Lubuk Talang Mamak Tebrau Melenai amounted to 265 souls. Fifty percent of the soul of them, been able to use his voice in the Presidential election and the election of Regents yesterday. 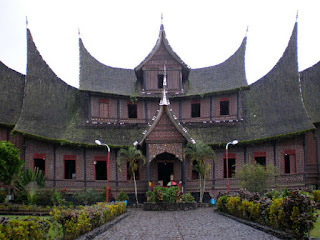 Most communities Talang Mamak believe supernatural forces on objects in the vicinity (animism). Some of the head of the family converted to Islam. They recognize that Islam is their religion, but to worship only in verbal enough alone. Overall, their livelihood is farming, rubber tapping, and take non-timber forest products. In addition to hunting or fishing as well. However, now seemed deserted hamlet Datai and many houses are not maintained anymore. "Now many who left his home, could be they're opening a new garden or also go looking for Jernang," continued Mr. Toad about the condition of its inhabitants. For cultural affairs, Society Talang Mamak National Park Bukit Tigapuluh little different with Tigabalai Talang Mamak-cultural center. This is evident from the absence of whet tradition and worship the king, and the erosion system mysticism. Generally, they live autonomously in the move so that the various problems that exist will be submitted to the village head. However, they are still thick with indigenous traditions. 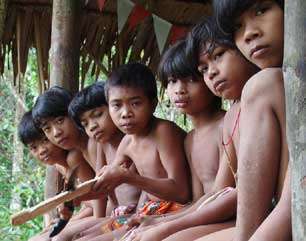 Call it Gawai (Wedding Feast), Kemantan (Medicine), mooring Bury (event 100 days of death), and circumcision for boys aged 12 years and over are considered to be approaching adulthood. So is the house that still shaped stage, as their characteristics, for example. Wooden building with no special room divider screens as well-from the kitchen to the bedroom-so, all the goods are still lying becomes a sturdy stand. Although they live traditionally, but for reliable medical problems as well. The results of Biota Medika Expedition (1998) show Talang Mamak tribe able to utilize 110 species of plants to treat 56 types of diseases and identify 22 species of medicinal mushrooms.